Sharing stories for and about the children and families we serve across 50 states and more than 80 countries. 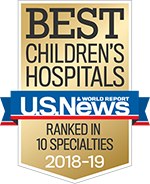 If your child is sick, this section is designed to help you make appropriate decisions on what level of medical care (if any) your child needs and, if the illness is relatively minor, what you can do at home to relieve symptoms. Notice: The information contained in this service is not intended nor implied to be a substitute for professional medical advice. It is provided for educational purposes only. Mom Docs are all pediatricians with St. Louis Children’s Hospital and Washington University School of Medicine. They work in the emergency room, the newborn intensive care unit, on the psychology team and more. They are also moms. We offer a variety of classes, activities and presentations throughout the year to the general community. Most of the programs are free; however, there are some that include a small fee. View the calendar of events to find out what classes and events are currently scheduled for the public. The Family Resource Center offers a place for parents to learn all about their child's specific illness or developmental stage. We not only help kids when they are sick or injured, but Community Education's goal is to keep them healthy and safe all year round. Providing health-related resources and education to families and communities in the St. Louis region to help keep them healthy and safe.